At first glance, it may look like an innocuous metal triangle more suited for art projects than for home projects, but a Speed Square can be your most powerful ally in so many home remodel projects. 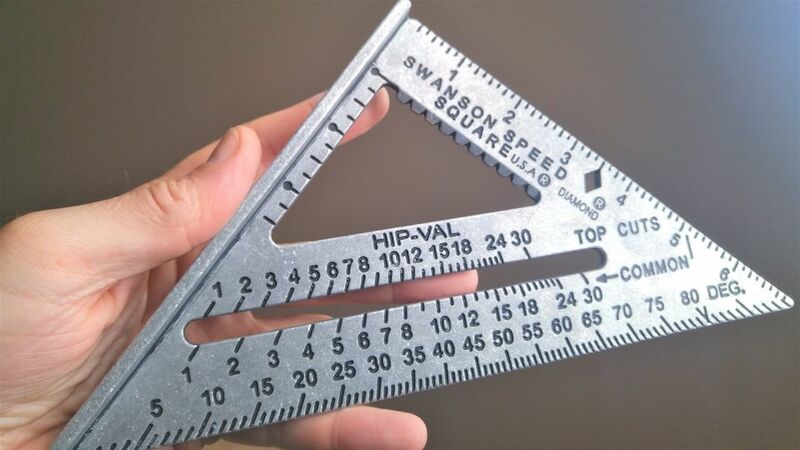 Nearly a century old, Speed Square is a renowned measuring tool patented and trademarked by the Swanson Company, which still manufactures the tool from its Frankfort, Illinois headquarters. Stanley, Irwin, DeWalt, Empire and a host of other tool companies produce similar products, but only the one made by Swanson is called a Speed Square. How can a single piece of heavy-gauge aluminum with no moving parts attract so many fans? Speed Square's true secret lies in the dense congregation of information and features packed on its face: a lipped fence, deeply incised numbers, holes, notches and cut-outs. It's these features that make this a highly functional yet very low-cost tool for scribing, marking and cutting. The accompanying 59 page "Swanson's Little Blue Book" is legendary in fine carpentry and roofing trades for helping translate Speed Square measurements into the real world. As a do-it-yourselfer, don't be put off by Speed Square's emphasis on laying out stairways and roofs. Even though few homeowners will ever cut their own stair stringers, and even fewer will install roof rafters and trusses, this doesn't mean that your Speed Square is off-limits to casual DIYers. Speed Square does do a couple of things that no other tool can do, but Speed Square's greatest advantage is as a fast, easy-to-read substitute for other tools that are bulkier or more difficult to pull out and get working. You Need to: Cut two pieces of flat trim or any material each at 45 degree angles. You want to form a 90 degree angle with those pieces. Example Applications: Installing door or window trim. How to: You can always haul out your electric miter saw or hunt for the manual miter box, but with Speed Square next to you in your toolbox, you can lay the square against the trim and create quick 45 degree pencil marks with the square. Do not cut directly against the square. Instead, remove the square and cut by following the line. You Need to: Find out if something is level and if not, exactly how many degrees out of level it is. Example Applications: Use for hanging cabinets, installing countertops, doors or windows or just about anything in your home that must be dead-level. How to: If you don't have or can't find your bubble or laser level, you can use Speed Square for this. Remarkably, it's almost preferable to using a bubble level because you can measure the exact deviation down the degree. On the Speed Square, locate the groove marked as 'Pivot." Place the Speed Square on the material with the pivot end up. Drape a string (such as a chalk snap line) over the Speed Square, resting in the pivot groove. Weight the hanging end of the string with a light weight such as a bolt. If the work material is level, the string will hit the 45 degree mark. You Need to: Lop off a 2x4, yet do it quickly and perfectly square. Example Applications: Cutting 2x4s is one of the most common activities in home improvement, which you'll use for finishing basements, building walls, etc. How to: The ability to squarely cut 2x4s is a classic Speed Square maneuver and is well worth the price of the tool just for this. Rest the square's lipped fence over the 2x4. Hold the square firmly. Cut against the square with a power saw, making sure that the saw's own fence slides along the square's fence. Do not let the saw blade run against the square. You Need to: Draw long pencil marks down the length of a board prior to ripping. Ripping means to cut a board along its length, not width. Example Applications: Cutting laminate or engineered wood floor boards. How to: Speed Square provides you with the ability to run long pencil marks parallel to the edge of the board. These marks can be between 3/8 of an inch to 3 1/2 inches from the edge of the board. Lay Speed Square on the board, with the lipped fence over the edge. Place your pencil in Speed Square's so-called Diamond cutout (for 3 1/2 inches) or in one of the ten notches located in the triangular cutout (for 3/8 of an inch to 3 inches). Use a regular pencil, not a carpenter's pencil. Slide the square down the length of the board, drawing the line as you go. You Need to: Find out if something is exactly perpendicular to another thing. Example Applications: Squaring a kitchen cabinet against another cabinet or against the wall. Bathroom cabinets, too, need to be squared. How to: Because Speed Square is so versatile, you may forget that it is still a square. Speed Square is best as squaring up smaller, shorter things rather than walls, because it is only 7 inches long (though Swanson also does offer a 12 inch version). For squaring up walls and rooms, you need at least a carpenter's square. Better yet is a laser level that casts an "X" mark. Place the Speed Square against the two elements (such as wall and cabinet). If there is a gap, this means that the two elements are not square with each other. You Need to: Adjust a circular saw so that its blade runs squarely at 90 degrees again. How to: Speed Square isn't just for squaring up work materials; it can be used for checking square on tools, as well. There are times when you have adjusted your circular power saw so that its blade runs at an angle other than the usual 90 degrees. Adjusting the saw back to 90 degrees by consulting the saw's markings isn't always accurate, especially for older tools. With the tool unplugged, rest one side of the Speed Square against the side of the blade. The other side of the square should rest against the bottom of the saw. Readjust the saw so that it is square against both sides of the Speed Square.